Amazing studio quality drum samples, recorded in great depth and realism. Drum sampling and drum replacement has improved by leaps and bounds since 1991 and the days of my first Alesis drum machine. New software packages offer a high level of realism previously unheard of. 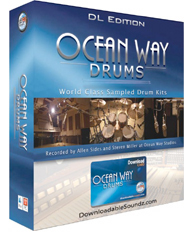 Ocean Way is one of the top names in the field, with Grammy Award winning producer/engineers Allen Sides and Steven Miller applying their expertise and gear to the Ocean Way Drums DL Edition ($249 MSRP) package. 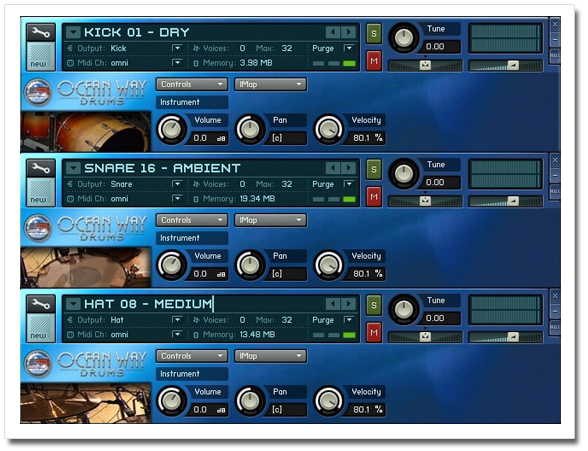 The Ocean Way Drums DL Edition runs on top of the NI Kontakt Player. To load the samples one has to run the OWD Expandable Library installer and drop the samples into it and the software takes care of installing them in the proper location. Installation took about 10-15 minutes during which time the software copied all the samples to the hard drive. Downloading the samples from downloadablesoundz.com proved near impossible as the heavy 90+ mb downloads timed out over a DSL connection and after several attempts I gave up and contacted customer support. They sent me a DVD which arrived within two days. The DL Edition features an installation DVD with 5 Ocean Way Drum DL Kits each with Dry, Medium and Ambient mix version for a total of 15 playable kit presets and a download card good for either 2 additional DL Stereo kits or 1 Multichannel Kit from the Silver and Gold Editions. The library could be expanded by purchasing other kits via downloadablesoundz.com. The package includes the Ocean Way Expandable Player powered by NI's Kontakt Player which works on all major DAW's (RTAS, VST, AU) or as a standalone player for Mac and PC. The samples are at 24bit/48khz resolution. In order to familiarize myself with the software I watched the DVD tutorial which came with the software. It was very informative and provided a great base to get started. I fired up Cubase 4 project on my Windows XP test machine and loaded the Kontakt Player as a VST plugin. I chose the standard GM format over the IMAP (Ocean Way's proprietary keyboard map format) as I was already familiar with that layout and proceeded to load the drum kits. The first impression about these kits is that there is nothing overblown or fake about them - honest drum kits recorded in a great sounding room. All of the samples sounded natural and permeated a level of realism that I am not used to hearing in some of the other packages. There are ghost notes, left/right hand samples, different strength cymbal hits and chokes and other detail that enhances the experience and could be added to a programmed track for a more realistic drum performance. These kits could be fine tuned further in Kontakt if necessary - the pitch could be dropped/increased on each sample, volume level and pan could be adjusted as well. Each one of the samples output to their own stereo fader which in turn could be tweaked further with plugin effects before being router to the master channel Kontakt. The level of the ambience could also be controlled via faders. The user can assign effects such as compression, eq, reverb and so forth in order to get a more "produced" sound. Some of these plugins are good, other are outright hard to work with, but with some care and experimentation I managed to add more slap to the kick and crack to the snare. The Kontakt Player allows you to mix and match kits as well, so you could build your own and save it as a preset. What I found limiting was the fact that you couldn't load your own .wav samples to augment the kit and the only way to do so is to purchase another samples pack. Luckily for us, Ocean Way has an extensive library of samples and they keep on adding new packs to it. The song I worked on needed a punchy metal drum sound that was meaty and at the same time deep, so in this case kit #16 (ambient) was a great starting point. There are no percussion or brush sounds, and judging by the natural sound of the kits, this library seems to be best suited for blues and rock production. I am quite impressed with the pedigree of this collection and would gladly recommend it to anyone that needs quality drum samples for drum production or drum replacement.